Are you a mobile developer which develop iOS and Android in the same time? Now, we have to show you 23 Android and iOS Material Design. Ready to use in your design. A bunch of modern UI elements is in this Kama UI. 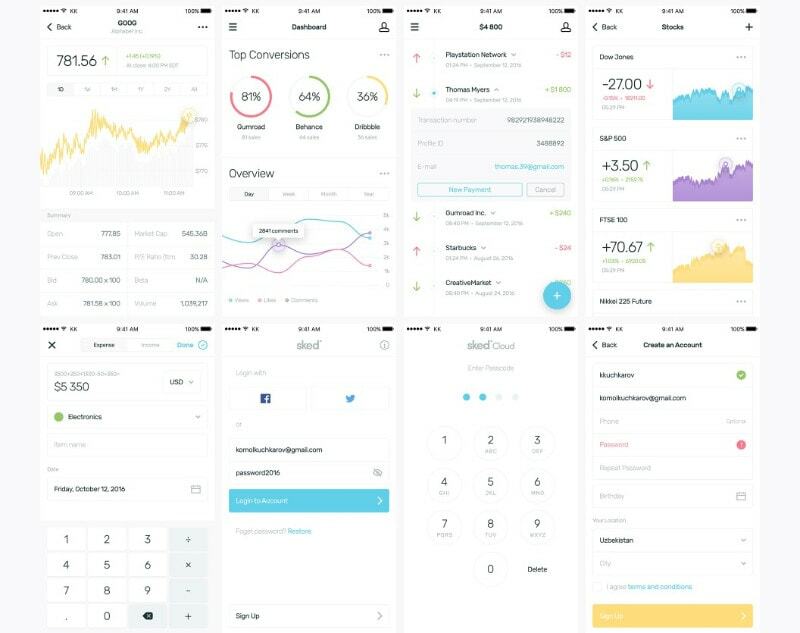 This amazing material design is ready to use in your iOS development. Colorful, full of color, that’s COLORISTIC. Crafted for any mobile platform (Android or iOS). Consist of 60 screens with high quality pixel. Elegant and modern material design for mobile mail app. This Mail App Startup Kit was design for any mobile device with various screen size. High quality and clean UI for mobile app. Suits for any e-Commerce mobile app production. You must try this Unveile UI kit. Boston UI kit has clean and luxury concepts inside. This pretty material design consist of 6 categories with 46 screens. High quality ready to use mobile iOS screen for your mobile development. The Scrent is professional material design which easy to edit and can bring modern concept in your app. This material design has tons of high quality and details in every elements. Tethr has 2 type designs inside, flat and dualtone with it’s simplicity. Nice 36 PSD screens and 12 elements category with more than 200 UI elements. Ready to use is your rapid prototyping or app development. Pulse is UI kit that made for iOS and Android for various app. This Pulse UI kit can bring your app to the next modern dimension. Ready to use in two popular image editor, Adobe Photoshop and Sketch. This Sked Mobile UI has nice data visualization for an iOS app. Simple and colorful, that is Kolorit. If you develop an app which has so many color combination, you must consider this one. MoneFlow is material design for an app that has a finance or money related app. This modern material design contains 15 unique screens. Music UI kit has almost every elements you need to build a music app in a mobile devices. This is a modern and elegant UI for music app. Not only for iOS, but Android too. Now, developing an iOS app for kid is easy with this Kidos iOS UI kit. Well designed and clean UI. Bring happiness is just one step ahead with this material design. Clean and elegant is this Mono UI Kit main concept. With this high quality material design you can craft your mobile e-Commerce with ease. Bring freedom in your chat app with this Chat UI. Clean and minimal material design, ready to use with high pixel screens. BookmyROOM app, redesign using guideliness in Google Material Design. Book a hotel room with ease. Rich of high quality elements. Easy to use, editable, and many screens are inside this UI. Digitick app in redesign version. Redesign in guideliness of Google Material Design. A travel app that bring more than 15 high quality PSD screens. Design and develop your app easily now with this UI. Your Restaurant app bring new experience in your restaurant or food related apps. Good designed, because this UI design follows Google Material Design guideliness. This My Ride mobile UI kit is new era of taxi booking systems. You can design your mobile taxi booking app in modern style. Retina ready and easy to use in a iOS development. This Parallax iOS Screen can be your prototype app or your real app, it’s your choice!